( the large hall ), Sapporo, Japan. 6 November 16:30, preformance, celebration at the Chapelle des Diaconesses, Versailles. 15 February 17:00, preformance, Community of Diaconesses of Reuilly, Versailles. 25 October, performance at St. Bernadette Chapel in Never, FRANCE. 30 October, special church service, preformance, Paris. 27 November, special church service, preformance, Chapelle des Diaconesses, Versailles. 6 December, performance at International Christmas Festival, Geneva, Switzerland. 7 December, performance at Church of the Living Saviour chuch service, Geneva, Switzerland. 24 November, preformance in Christmas service at Annonciation Reformed Church, Paris. 25 December, preformance in Christmas church service at Chapelle des Diaconesses, Versailles. 24 November, preformance in church service "UNIVERSAL DAY" at Annonciation Reformed Church, Paris. 8 December, private concert, preformance, Paris. 25 November, preformance in Christmas service at Annonciation Reformed Church, Paris. 26 February, 16:00, Mr.Devy Erlih Memorial Concert at Saint-Merry church, Paris. 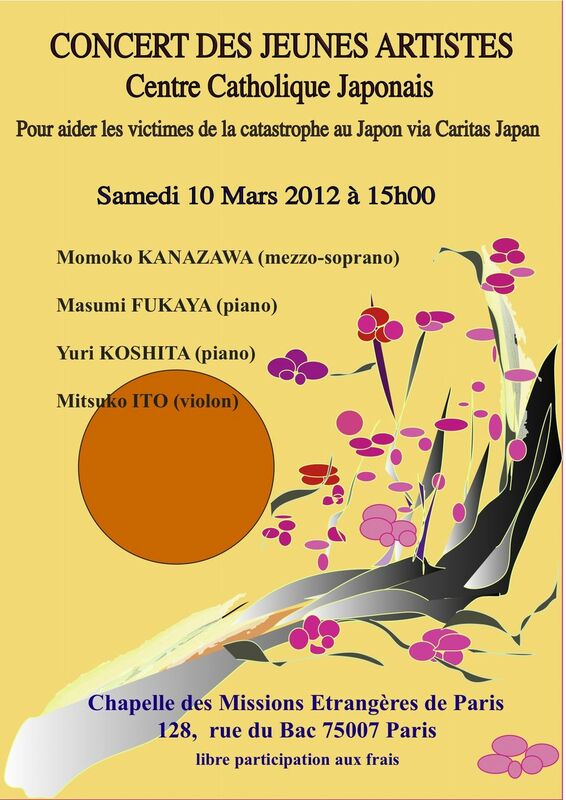 10 March, 15:00, charity concert for Japan at Paris Mission Catholic Church, Paris. 18 June 20:30 �ｼ� The doors open at 20:15, admission free ) , preformance at St. Roch Church, Paris. 21 June, private concert, preformance, Paris. 6 October, wedding at Paris Mission Catholic Church, Paris. 7 December, surprise performance at a charity concert at the John Knox Center, Geneva, Switzerland. 8 December, guest performance at International Christmas Festival, Geneva, Switzerland. 9 December, performance at Church of the Living Saviour chuch service, Geneva, Switzerland. 25 December, 10:30AM, preformance in Christmas church service at Auteuil Reformed Church, Paris. 21 April, preformance in church service at Annonciation Reformed Church, Paris. 16 May, 2nd prize at Bellan International Competition ( Trio ). 3 October, preformance at Kiriko Glass Art Exposition in Espase Culturel Bertin Poiree, Paris. 笘� 蛻�蟄舌ぎ繝ｩ繧ｹ縺ｯ螟ｧ螟臥ｾ弱＠縺�縺ｧ縺吶�よ弍髱槭＃隕ｧ荳九＆縺�縲� / Kiriko Glass Art is very beautiful. I recommend you to visit. 1 January, solo with Massy Opera Orchestra in New Year Concert at Massy Opera, FRANCE. 1 January, solo with Massy Opera Orchestra in New Year Concert at Longjumeau Theatre, FRANCE. 5 January, performance at Salle Cortot, Paris. 24 February, recital at Red Cross St. Agnes old people's home, Paris. 2 April, preformance in church service at Annonciation Reformed Church, Paris. 3 April, preformance in church service at Annonciation Reformed Church, Paris. 22 May, solo with Meaux Flute Orchestra at St - Denis Church, Quincy - Voisins, FRANCE. 5 June, solo with Meaux Flute Orchestra at Espace Caravelle in Meaux, FRANCE. 6 June, performance in Mass at St. Bernadette Chapel in Never, FRANCE. 7 June, performance in Mass at Chapel in Espace Bernadette, Never, FRANCE. 15 July, recital at Makomanai Myojo Kindergarten, Sapporo. 17 July, Fureai Concert ( recital ) at Makomanai Church, Sapporo. 22 July, Mitsuko Ito Violin Recital at Epoa Hall, Ebetsu. 28 July, Summer Breeze Concert 竇ｦ ( recital ) at Hoheikan, Sapporo. 1 August, PMF Meeting 10 at Caffe di Lenny, Sapporo. 18 August, performance at Hotel Nord, Otaru. 20 August, recital at Nirenokai, Sapporo. 21 August, private recital, Sapporo. 24 August, Mitsuko Ito Violin Concert ( recital ) at Fukushimura, Kurisawa. 27 August, recital at Nirenokai, Sapporo. 29 August, performance in Mass at Konopporo Catholic Church, Sapooro. 3 September, Mitsuko Ito Violin Recital at Chieria Hall, Sapporo. 11 September, Mitsuko Ito Violin Concert ( recital ) at Hotel Nord, Otaru. 14 September, 80th anniversary recital at Irifune elemetary school, Otaru. 15 September, Myomu Concert ( recital ) at JR Tower, Sapporo. 17 September, private recital, Sapporo. 18 September, performance at L 繝ｻ PLAZA, Sapporo. 19 September, charity concert ( recital ) at Muroran Catholic Church, Muroran. 31 October, preformance in church service at Annonciation Reformed Church, Paris. 10 February, performance at Villa Maleserbes, Paris. 16 March, private recital, Paris. 28 March, recital at Neuilly Sur Seine, FRANCE. 9 April, recital at Salle Cortot, Paris. 10 May, preformance in church service at Annonciation Reformed Church, Paris. 16 May, performance at Neuilly Sur Seine, FRANCE. 17 July, recital at Oasa Fuji Kindergarten, Sapporo. 20 July, recital at Hokkaido Bungakkan ( PMF Talk Session ), Sapporo. 26 July, PMF Meeting 09 at Caffe di Lenny, Sapporo. 31 July, Summer Breeze Concert 竇･ ( recital ) at Hoheikan, Sapporo. 5 August, performance at Nakaichi, Otaru. 7 August, recital at White Rock Music Tent, Pink Ribbon Summer Festival, Sapporo. 20 August, recital at Boyodai elemetary school, Otaru. 21 August, recital at Nirenokai, Sapporo. 22 August, charity concert ( recital ) at Iwamizawa Catholic Church, Iwamizawa. 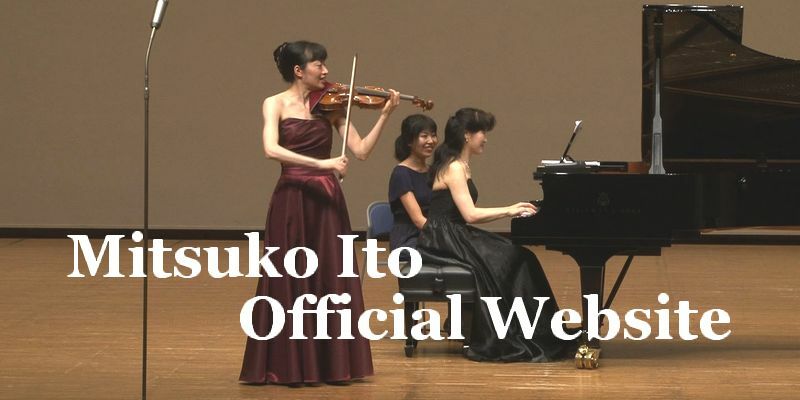 27 August, Mitsuko Ito Mini Concert ( recital ) at Hoheikan, Sapporo. 4 September, Mitsuko Ito Violin Recital at Chieria Hall, Sapporo. 8 September, recital at Momijidai Minami junior high school, Sapporo. 12 September, Mitsuko Ito Violin Concert ( recital ) at Marine Hall, Otaru. 12 September, performance at Bine, Otaru. 18 September, recital at Nirenokai, Sapporo. 21 September, private recital, Sapporo. 17 December, performance at Villa Maleserbes, Paris. 1 April, performance at Salle Cortot, Paris. 11 April, recital at Salle Cortot, Paris. 26 May, performance in Mass at Jean Jaures Catholic Church, Paris. 3 June, performance at Novotel Paris Tour Eiffel, Paris. 29 June, preformance in church service at Annonciation Reformed Church, Paris. 5 July, performance at Hokkaido Univercitiy, Sapporo. 9 July, recital at Koganeminami Day-care Service Center, Eniwa. 14 July, recital at Eniwa junior high school, Eniwa. 17 July, recital at Higashi elemetary school, Iwanai. 17 July, recital at Chuo elemetary school, Iwanai. 17 July, recital at Nishi elemetary school, Iwanai. 24 July, Chapel Concert ( recital ) at Sapporo Park Hotel, Sapporo. 27 July, PMF Meeting 08 at Caffe di Lenny, Sapporo. 30 July, Summer Breeze Concert 竇､ ( recital ) at Hoheikan, Sapporo. 5 August, recital at Nirenokai, Sapporo. 8 August, JR Fureai Concert ( recital ) at Soen JR Center Bldg., Sapporo. 23 August, charity concert ( recital ) at Iwamizawa Catholic Church, Iwamizawa. 30 August, Mitsuko Ito Violin Concert ( recital ) at Bine, Otaru. 5 September, Mitsuko Ito Violin Recital at Chieria Hall, Sapporo. 12 September, recital at Momijidai Minami junior high school, Sapporo. 18 September, Mitsuko Ito Violin Concert ( recital ) at RB Park Center Bldg., Eniwa. 21 September, charity concert ( recital ) at Muroran Catholic Church, Muroran. 27 July, Mitsuko Ito Violin Concert ( recital ) at Migishi Kotaro Museum, Sapporo. 28 July, memorial concert ( recital ) of Ms. Minami at Tsukisamu Catholic Church, Sapooro. 29 July, PMF Meeting 07 at Sapporo Art Park, Sapporo. 2 August, recital at Jujikan, Sapporo. 8 August, Summer Breeze Concert 竇｣ ( recital ) at Hoheikan, Sapporo. 10 August, recital at Teine Keijinkai Hospital's lobby, Sapporo. 18 August, Mitsuko Ito Violin Concert ( recital ) at Marine Hall, Otaru. 21 August, recital at Atsubetsu Nishi elemetary school, Sapporo. 23 August, recital at Momijidai elemetary school , Sapporo. 25 August, Museum Concert ( recital ) at Hokkaido Kindai Museum, Sapporo. 31 August, Mitsuko Ito Violin Recital at Epoa Hall, Ebetsu. 7 September, Mitsuko Ito Violin Recital at Chieria Hall, Sapporo. 14 September, recital at Seien junior high school, Otaru. 19 September, recital at Nirenokai, Sapporo. 21 September, recital at Care-house Uraraka, Sapporo. 15 December, guest performance at International Christmas Festival, Geneva, Switzerland. 16 December, performance at Church of the Living Saviour chuch service, Geneva, Switzerland. 13 July, Kinotoya Salon Concert ( recital ) at Sankakuyama Renganoyakata Hall, Sapporo. 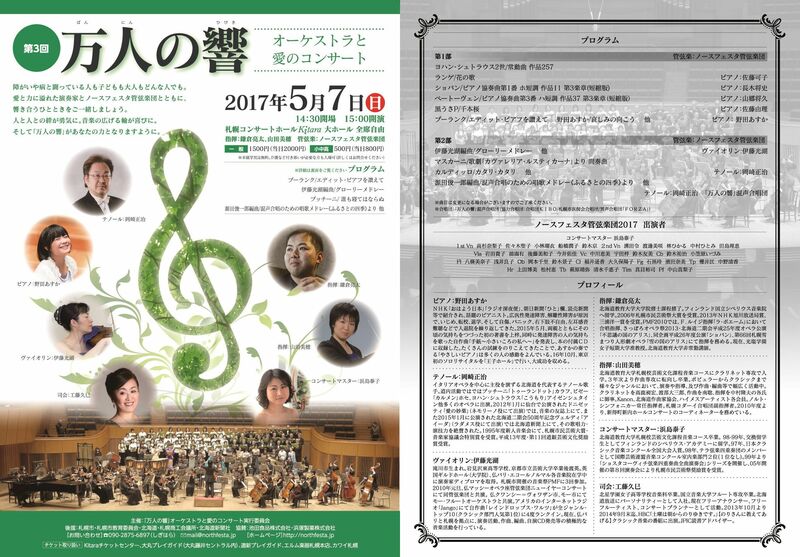 15 July, Talk Classic Concert ( recital ) at Atsubetu Town Hall, Sapporo. 18 July, recital at Furano elemetary school, Furano. 23 July, Mitsuko Ito Violin Concert ( recital ) at Artepiazza, Bibai. 26 July, Summer Breeze Concert 竇｢ ( recital ) at Hotel Okura, Sapporo. 30 July, PMF Meeting 06 at Sapporo Art Park, Sapporo. 5 August, Mitsuko Ito Violin Recital at Engeki Kojo, Furano. 19 August, charity concert ( recital ) at Iwamizawa Catholic Church, Iwamizawa. 25 August, recital at Atsubetsu Nishi elemetary school, Sapporo. 29 August, recital at Nirenokai, Sapporo. 1 September, Kinenkan Concert ( duo recital ) at Tyoryo Kinenkan, Otaru. 8 September, Mitsuko Ito Violin Recital at Chieria Hall, Sapporo. 16 September, recital at Wako elemetary school, Eniwa. 20 September, recital at Nagahashi elemetary school, Otaru. 22 September, recital at Nirenokai, Sapporo. 16 December, guest performance at International Christmas Festival, Geneva, Switzerland. 17 December, performance at Church of the Living Saviour chuch service, Geneva, Switzerland. 10 January, recital at Espase Culturel Bertin Poiree, Paris. 16 April, private recital, Paris. 3 June, private recital at Softel Forum Rive Gauche, Paris. 18 July, charity concert ( recital ) at Iwamizawa Catholic Church, Iwamizawa. 27 July, Summer Breeze Concert 竇｡ ( recital ) at Hotel Okura, Sapporo. 31 July, PMF Meeting 05 at Sapporo Art Park, Sapporo. 4 August, recital at Teine Keijinkai Hospital's lobby, Sapporo. 27 August, Talk Classic Concert ( recital ) at Atsubetu Town Hall, Sapporo. 28 August, Family Concert ( recital ) at RB Park Center Bldg., Eniwa. 20 August, Mitsuko Ito Violin Concert ( recital ) at Bine, Otaru. 1 September, recital at Atsubetsu Nishi elemetary school, Sapporo. 9 September, Mitsuko Ito Violin Recital at Chieria Hall, Sapporo. 13 September, recital at Boyodai junior high school, Otaru. 14 September, recital at Eniwa elemetary school, Eniwa. 20 September, recital at Nirenokai, Sapporo. 17 December, guest performance at International Christmas Festival, Geneva, Switzerland. 18 December, performance at Church of the Living Saviour chuch service, Geneva, Switzerland. 30 March, performance at Gerard Philippe Theatre, FRANCE. 12 June, private recital at Maisons - Laffitte, FARNCE. 28 July, Summer Breeze Concert 竇� ( recital ) at Hotel Okura, Sapporo. 1 August, PMF Meeting 04 at Sapporo Art Park, Sapporo. 14 August, 30th anniversary chamber music concert of Iwamizawa Higashi high school's choir at Bunka Center, Iwamizawa. 15 August, 30th anniversary chamber music concert of Iwamizawa Higashi high school's choir at Chieria Hall, Sapporo. 21 August, Mitsuko Ito Violin Concert ( recital ) at Marine Hall, Otaru. 27 August, Citizen's Lobby Concert ( recital ) at Sapporo Town Hall, Sapporo. 27 August, Sky's Concert ( recital ) at Sapporo JR Tower T38 ( an observatory ) , Sapporo. 29 August, charity concert ( recital ) at Konopporo Catholic Church, Sapporo. 10 September, Mitsuko Ito Violin Recital at Chieria Hall, Sapporo. 15 September, recital at Nirenokai, Sapporo. 16 September, recital at Teine Keijinkai Hospital's lobby, Sapporo. 16 September, recital at Wako elemetary school, Otaru. 17 September, recital at Okusawa elemetary school, Otaru. 21 November, recital at Maisons - Laffitte, FARNCE. 4 December, guest performance at International Christmas Festival, Geneva, Switzerland. 5 December, performance at Church of the Living Saviour chuch service, Geneva, Switzerland. 16 April, Mitsuko Ito Violin Concert ( recital ) at Pres Vert, Sapporo. 31 July, Clocktower Concert ( recital ) at Sapporo Clock Tower, Sapporo. 1 September, recital at Hanazono elemetary school, Otaru. 1 September, recital at Shioya's institution, Otaru. 17 September, recital at Nirenokai, Sapporo. 22 September, recital at a Moiwayama Observatory Restaurant, Sapporo. 6 December, guest performance at International Christmas Festival, Geneva, Switzerland. 24 December, private recital, Northern Ireland. 25 December, private recital, Northern Ireland. 2 June, private recital, Paris. 27 June, recital at Espace Francois Collet, Paris. 22 July, performance at the courtyard of the Town Hall at Brive - la - Gaillard, FRANCE. 23 July, performance at Brive - la - Gaillard, FRANCE. 20 August, Romantic Duo ( recital ) at Hotel Sheraton, Sapporo. 23 August, recital at Nirenokai, Sapporo. 27 August, recital at Hanazono elemetary school, Otaru. 27 August, Mitsuko Ito Violin Concert ( recital ) at Uminekoya, Otaru. 1 September, live broadcasting on Radio Nostalsia, Sapporo. 5 September, recital at Nirenokai, Sapporo. 17 November, recital at Maisons - Laffitte, FARNCE. 7 December, guest performance at International Christmas Festival, Geneva, Switzerland. 8 December, performance at Church of the Living Saviour chuch service, Geneva, Switzerland. 23 December, private recital, Northern Ireland. 23 February, Mitsuko Ito Violin Recital at Chieria Hall, Sapporo. 10 March, Spring Concert ( recital ) at Diomond Chapel Hongodai Christ Church, Yokohama. 15 April, Easter Celebration at Royal Albert Hall, London. 19 July, performance at Brive - la - Gaillard, FRANCE. 21 July, performance at Brive - la - Gaillard, FRANCE. 24 July, performance at the courtyard of the Town Hall at Brive - la - Gaillard, FRANCE. 24 April, Easter Celebration at Royal Albert Hall, London. 5 April , Easter Celebration at Royal Albert Hall, London. 10 July, performance at Classic Concert in the gallery of Kensington & Chersea College, London. 15 July, performance on London Premier Radio, London. December, performance on London Premier Radio, London. 12 December, guest performance at International Christmas Festival, Geneva, Switzerland. 13 December, performance at Church of the Living Saviour chuch service, Geneva, Switzerland. 15 December, joint recital at St. Peter's Church, London. Lunchtime Recital at St Mary le Strand Church, London.